Ah, the Lone Star quilt—it’s a design that many quilters have made, want to make, or wish they could make but might be afraid to try. 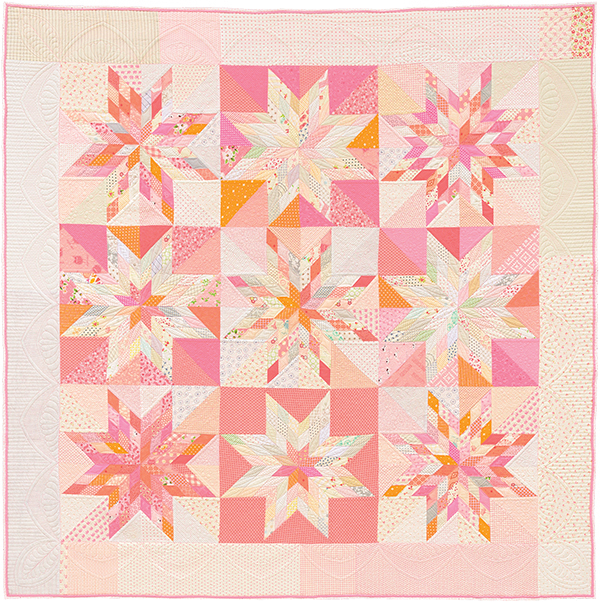 Sherbet Stars by Lissa Alexander from Oh, Scrap! Well, whether you have made, want to make, or wish you could make a Lone Star quilt, Oh, Scrap! author Lissa Alexander is here to cheer you on! 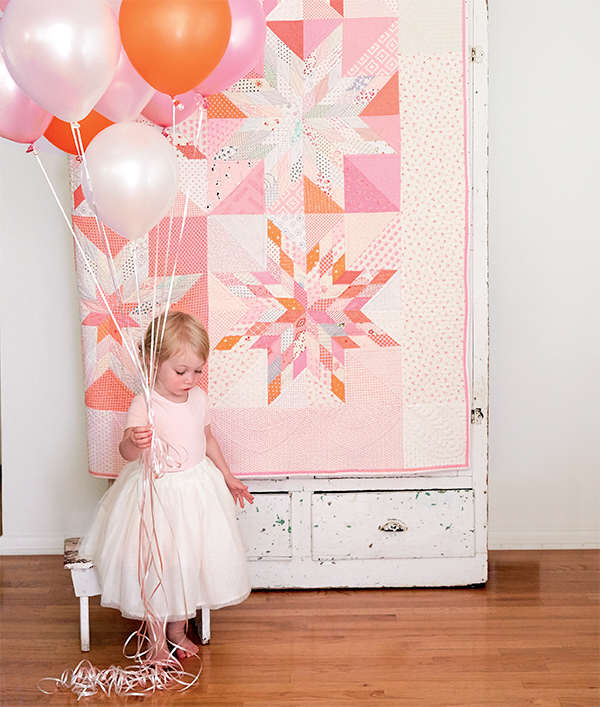 Her exquisite Sherbet Stars quilt (above) is a fan favorite—you can see why 😍—and she recently shared with us the piecing and pinning tricks she used to sew her star-studded design. Love that scrappy strip-piecing trick. Pure genius. 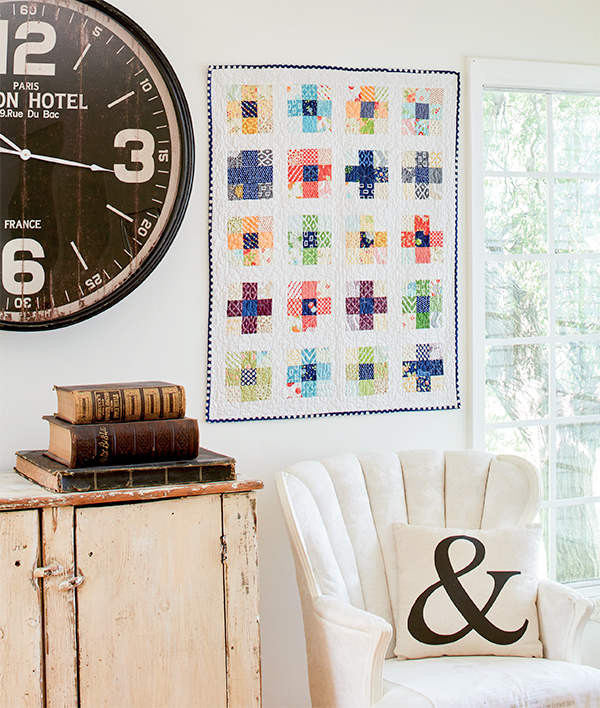 See seven more quilts from Oh, Scrap! here. Lissa packed up the surplus of scraps she had left over after writing her best-selling book and sent them to us—so we could send them to TWO of YOU! Two of you will have the chance to make Awesome Land too, with Lissa’s scraps to get you started and a copy of Oh, Scrap! I have no idea what most of the shapes I have are called! Share your answer in the comments to be automatically entered into the drawing. We’ll choose two random winners one week from today and let you know by email if you win. Good luck! And if you’re ready to start your own Lone Star quilt or any quilt from Lissa’s book, purchase Oh, Scrap! at our website and you can instantly download the eBook for free. C. I have no idea what these shapes? might be, I always mean to cut them and store by color as I finish a quilt, but it never happens. Every size: strips, rectangles, odd pieces, anything bigger than an inch gets saved in two big tubs! I love fabric! After finishing a project I cut the leftover fabric into squares–whatever I can–2 1/2, 3 1/2, 4 1/2, 5 1/2 and 6 1/2–and keep them in separate baggies. Whenever I feel like sewing something scrappy, it makes it so much easier! C. I sort by color, not shape, so I have no idea what most of them would be called. A combination! Squares and triangles. Love making scrap quilts. I have a combination of scraps. I found a little bit of time to cut some of my scraps into rectangles & squares & strips, but I have a full garbage can full of all kinds of shapes waiting for me to trim into shapes. The problem is they multiply at night…. I have cut my scraps into 2”, 3” squares for a future scrappy quilt. I have 2” and 3” squares. My scrap basket contains all kinds of sizes, shapes, and colors. I have been collecting for years. Just waiting for the time and the perfect pattern to put my quilt of memories in motion!! Some of my scraps are strips, but most are random shapes, all stuffed into a huge plastic bin! I need to USE them! My scraps are all shapes and sizes since I seem to have issues throwing away any but the smallest bits of fabric! I even have a bin of selvedges! It’s definitely time for some Scrappy projects!! I have lots of strips and squares. Have a great day! I have no idea what these shapes might be, usually leftover fabric from finished quilts. I have strips and squares, and a bunch of tbd! My scraps are all shapes and sizes. They are organized by color and I can make things fast with my sraps. I love to use all shapes to make different patchwork quilts. Thanks for the opportunity to win this wonderful giveaway !! I have no idea what most of the shapes I have are called. I try to cut odd leftovers from projects into 2 1/2″ squares or strips. I also have an entire bin of 5″ squares. Just got a new grand-daughter and would love to make her a Lone Star quilt – those sherbet colors are beautiful! I have loads of squares and strips. And a bucket load of the! Mostly strips and squares. I really need to make something with my scraps! I’ve been working through my scrap basket cutting squares and strips. Now, I need ideas to stitch them together. This book is perfect! When I finish with a piece of fabric and it’s small enough to be called a scrap, it goes into its jar, by colour, to wait for a specific project. I also collect 2.5” strips. I tried cutting them into shapes before storing them, but they never seemed to be useful to me. I think my stash is too eclectic for that. I LOVE scraps! What beautiful quilts. My scraps are a mixture of all three. Book & scraps would be a fun win! When I started sewing, everyone at work brought me their left over material! My scarps consist of any and everything. My scraps are in every shape and size. Scrap quilts are my favorite. I cut my scraps into 2 1/2 inch strips, 5 inch squares and 2 1/2 inch squares. Anything smaller I make beds for our local shelter. My scraps are strips, squares and rectangles (my OCD is showing) because I love the clean, simple lines that these shapes make up into quilts! Definitely more strips and squares in my stash, but triangles are increasing. 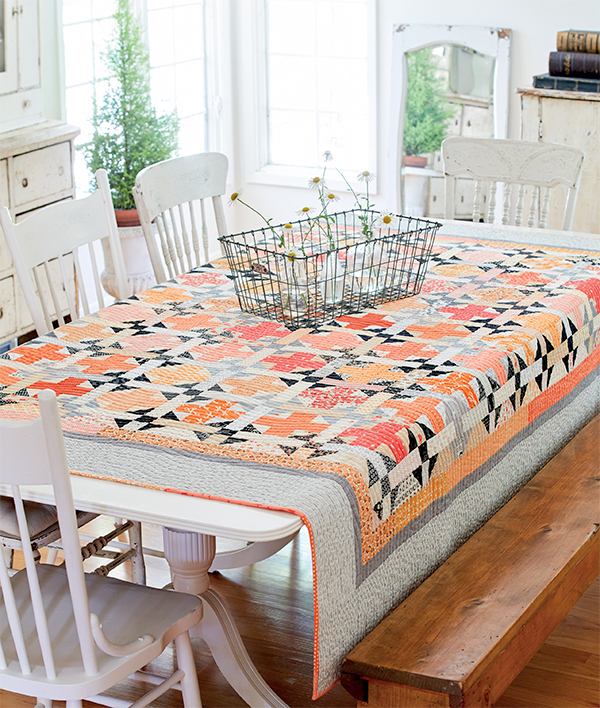 Love the splendid strips and lone star quilts! All of the above shapes are in my scraps. Rarely throw anything away. Absolutely love the sherbet stars and the sweet model. You’ve inspired me to get my scraps together! 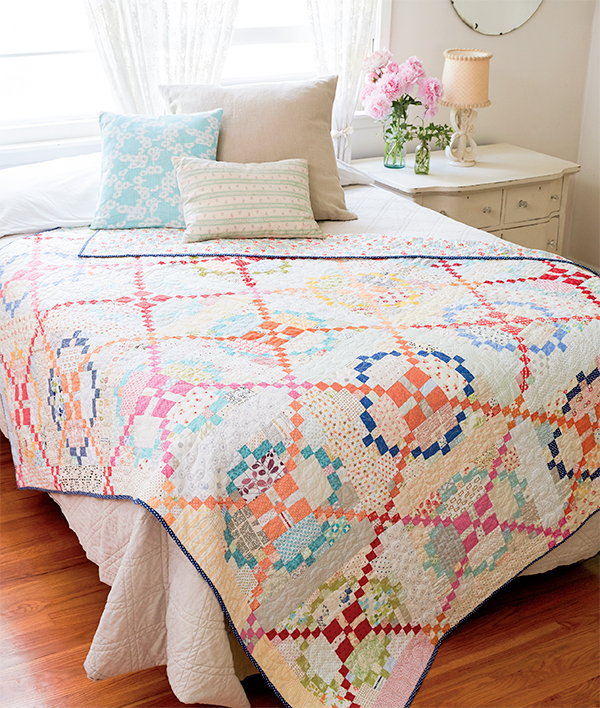 Absolutely loved Sherbert Stars quilt. I have all of the different shapes in my scrap stash. The book looks very interesting. Mostly 2 1/2″ and 5″ squares and 2 1/2″ strips. I try to make LOTS of USEFUL SCRAPS!!! Oh my! I have shapes of every size! This book looks wonderful am putting it on my wish list! I have all shapes as far as scraps are concerned. Would love to get them all organized but still working many hours – there is never enough time in the day. Thank you for the inspiration!!!! I am trying to organize my scraps. I’ve been cutting things into 5 inch or 2.5 inch squares if the pieces are small. I also have a bunch of 2.5 inch strips cut. This will be an on going project. I have a lot to organize. I love the patterns in this book. It would take care of a lot of my scraps. Thanks for the chance to win. I have the wildest "set" of scraps! Some of everything. I put them by colors in buckets on their sides in a shelf with 9 "pockets." That way, I can grab a bucket by color and see what I have to use for a certain project. If I don’t have the right scraps, I go to one of my daughter’s scrap collection! Between the three of us, we can make almost anything!!! We might lack orange. It just isn’t something we tend to buy when shopping. My favorites are triangles and rectangles, especially now since there are so many plastic rulers that make it easier to cut each irregular shape scrap into the appropriate size. Strips and squares, definitely. Thanks for the opportunity to win. Triangles and rectangles make up more of my scraps, but of course there are strips and squares as well. My scraps are mostly fat rectangles and strips, but they hold such potential. There could be anything in there! The majority of my scraps are strips and squares with a couple stacks of Christmas fabric triangles thrown in that are left over from a badly judged holiday project! Triangles and rectangles are my favorite especially now that there are many plastic templates you can use on your irregularly shaped scraps. Most of the time I cut my scraps into squares. I have them sorted by size. I do have some triangles. I try to sew HST as I trim them from blocks.Thanks for the chance to win. Most of my scraps are strips and squares and kept randomly according to modern and traditional so I can sort through them for that surprise inspiration. Larger pieces are folded and put back in my stash by color. I definitely have mostly strips and squares in my stash. Thank you for the offer of Lissa’s book and fabric! Strips and squares and bags of scraps to be cut into strips and squares. Oh, Scrap! looks like an awesome must have book. My scrap bin definitely falls in that last category of ‘I have no idea…’! Love Lisa’s book and cannot wait to get my hands on a copy! I love scraps, and just can’t throw them away. When I need something to do (ha! ), I cut them into strips, or different size squares. Strips and squares. Lost most in a house fire last year. Scraps- just that – scraps of every color , length and width. A bounty of fabric with no destination – yet !!! Well – my scraps would probably be called a "mess" of all kinds of "scraps" not particularly organized in any shape, size or form. But it works for me 🙂 I would love to win this book as I have always wanted to try a Lone Star, but have been afraid to tackle it. Maybe I could do it with this book ! I have tons of just small irregular pieces and lots of strips. I adore the pink lone star quilt!! I want to hug it!! All the quilts from the book are beautiful! My scraps are sorted into squares/strips of 2, 2.5, 3.5, 5, and 6 " and then into light and dark drawers for each. I love the look of this and the video was fabulous. I have more strips in my stash of scraps. I have them arranged by color so I can easily find what I need. I would love to win Oh, Scrap! to help me use up more of these scraps in my stash. Thanks. Strips & squares for sure – although some of them are so big they perhaps don’t qualify as scraps! Beautiful quilts in this book. I am trying a new method of strips and squares. A local quilter gave a seminar at our LQS about her method to use up similar sized scraps by placing them all cut up in a small plastic container. Once it’s full, make a scrap project. I will give this a try…..for a while!! I have bags of scraps that are mostly squares and rectangles. I’m really wondering what to do with this color wheel of fabric. I have mostly strips saved. I’ve been sewing up my half square triangles as leaders/enders. Most of my quilts are made of strips and squares. I think most of my scraps end up to be squares and triangles but there are times when they are really strange shapes. Most of my scraps are rectangles or half square triangles. I have a few no idea what shapes too. I am finally starting to organize my scraps so right now they are in squares, triangles and pieces waiting to be cut into something. Strings, strips, long chunks – mostly! Love scraps! While I have a ton of scraps the majority are strips. Smaller pieces I save for scrappy applique. Great giveaway. Hugs. For the most part C, just a hod-pog of leftovers from previous quilts. And yes I do use from my leftover bin. I have no idea. I through iscraps in a basket & sort through by color when needed. The scraps from these quilts are just so inspiring! I’ve been wanting to make a scrappy quilt for a daughter-in-law and these bright colors would be perfect. Triangles and rectangles make up most of my scraps! Piles of little triangles! I’ve never made a Lonestar so I’d love to see how easy it would be with this book! I have Lissa’s book and love the inspiration! My scrap stash is mostly the first two options…squares and strips, triangles and rectangles. My go to shape is a 2 inch square but at the moment I’m piling up a ton of triangles I’m cutting off the pieces I’m making. They are matched up and ready to be sewn together for some fun half square triangle mini. Strips and squares. I have been good and after each project cut the leftovers into strips and squares for future scrap quilts. Most of my scraps are squares and strips. I would love to have this book to thin out my stash. Triangles and rectangles make up more of my stash. Thanks for the chance to win this giveaway! I’m loving scrap quilts more and more. This is a great book and I would love to win it to use up my scraps which consists mostly of squares and rectangles. Every shape under the sun. I am a scrap quilt junkie! Mostly strips and rectangles sorted more or less by colour. Strips and squares fill my stash. Great video! Lone stars are such fun to make! I have scraps-in-waiting — yardage that someday will be cut for quilts, thus producing scraps. I sort m y scraps by strips, squares and triangles..I break these down into different sizes. I love my scraps and find I work mostly with scraps. Most of my scraps are squares and strips, although none are sorted and trimmed to usable sizes. Most of the time I toss my scraps in a bin and cut them as I work. I do have several 2″ strips cut from when I felt ambitious. I try to cut my extra scraps into strips and squares because those are the shapes I use most often in my quilts! Most of the time I toss my scraps in a bin and cut them as I work. Lately it’s been strips and squares since I’ve been jelly rolling along! This book looks wonderful! I have more irregular pieces than strips or squares. I do have them sorted by colors for the most part. Strips and squares. By the way, I am in the land of Star Quilts. I currently live in South Dakota where the Lakota Sioux give star quilts as gifts at funerals, life celebrations and happier occasions. They give star quilts in place of the buffalo robes which were given earlier in their culture. The quilts are a symbol of respect and celebrate life’s challenges and accomplishments. I have strips and squares. i have been trying to cut my leftovers into usable sizes, but it is slow going. I do have a pile of triangles also, as I save the pieces cut off when making connector corners. Many fo those have been sewn, but not squared up. My scraps are not organized at all! I have tiny little pieces to large chunks leftover from projects. I hope to get organized one of these days! I have everything from squares triangles to strips and rectangles. What to do with them is the problem! My scraps are strips and squares and bits and pieces!!! Love scrap quilts!! Thank you for the chance to win! Ooh! I love scrap quilts and working with someone else’s scraps is so much fun! I have a lot of strips, squares and triangles in my scraps, but the majority of my scraps are bigger chunks waiting to be cut into whatever shape I might need for a project. My scraps are squares, rectangles, a little of this and that. Sounds like a recipe for mix vegetable soup. Definitely no idea what they’re called. Although I am in the process of organizing them in to strips and some kind of order. All shapes, all sizes. I keep everything! Stored by colour. My scrap bins are mostly filled with strips and squares. I have no idea what shapes my scraps are, I would love to win this package so that could use them in something constructive. Some of my scraps are sorted by color, some by shape, but most are just in bags waiting to be used. Strips and squares. Great tutorial and lovely quilts! I have plenty of every kind of scrap listed. I am a huge fan of scrap quilts and always have leftovers that I should organize, but that would just take away from sewing time. 😊 Thanks for a chance to win. Strips and squares for sure! I have no idea what most of the shapes I have are called! I save all my scraps from a project together in a zip lock bag. I have thought of doing miniature versions of the project, however haven’t done one yet…lol. From triangles and squares to ???? Right now the bulk of my stash is in just pieces, chunks and tidbits. I have started though making squares, strips and strings. Would love to become the proud owner of this lovely giveaway! Ditto. Some strips and leftover HSTs, but mostly odd shapes in varying sizes, sorted into shoe bins by color. I have too many scraps sorted by color to notice any shape so "I don’t know" is the best answer. Once a year, I organize my scraps and sort by color down to crumbs. Then I am free to develop Free scrap quilt projects based on color. I love scrap quilts! More strips than any other shape. I made log cabin quilts for years. Also have lots that need to be cut into usable scraps. I have no idea what most of the shapes I have are called. I have all shapes, all sizes, and all colors. I’m teaching my grand-daughter how to quilt. She is now 10, but made her first scrappy quilt last year. She has proudly made three. She goes right to the box of scraps, and loves to be able to select her own colors. Thank you for the opportunity to enter a great give-a-way…. Right now it’s mostly strips, but there are so many assorted sizes and shapes that it’s overwhelming!! Most of my scraps are strips and rectangles. I love scrappy quilts!! Some are orphan squares/rectangles/triangles or just left over pieces. The video shared a nice way of using up all those "useless pieces of fabric". my scraps are mostly strips, squares, and rectangles. i need to organize them by color but i am too busy creating more scraps. My stash scraps range from pastels to bold and bright. I prefer small prints. I have no idea what shape my scraps are in! All I know, there are a lot of them. Strips and squares. I try to cut my leftovers up into strips when I can. Always cut my scraps into 2 1/2” strips or squares. Strips and squares are my scrap piles. I have mostly strips and squares but I have also saved little bits of triangles because I don’t dare throw anything away!! I keep ALL my scraps so-I have some of every shape and size! Love Lissa’s leftovers, I spy some Chestnut Street fabric there! I have a combination of strips, bonus triangles, but no squares. The rest is a jumble of I don’t know what shapes. Triangles and rectangles -and I never seem to make anything with them. I have mostly strips and squares in my scrap stash, but lots of leftover triangles too. My stash is mostly strips and squares with a few triangles thrown into the mix. I would love to get this book so thanks for the opportunity to win it. I have so many scraps that all the descriptions you offered are what I have! But if I had to choose a description, I’d say I have more squares than anything – perfect for making scrappy quilts! Odd shapes! I have just is what left over. And I do have a collection of triangles that have been cut off from an assortment of quilts! So many scraps. So many shapes. So much organizing to do. It intrigues me when a scrappy quilt is so coordinated. I love the Splendid Scraps and Firecrackers quilts! I have a robust string collection, sorted by color. They have been used in many, many projects. No idea, but probably squares. I’ve mostly got strips and squares in my scraps. Some strips and squares, some triangles, but mostly lots of random shapes of fabric, some purchased at estate sales or just leftover pieces from yardage. Scrap quilts are all I make! Mostly strips and squares, although there is a big bucket of scraps waiting for a change of shape. Lovely designs in this new book. All of the above! My room is full of scraps just waiting to find their place to shine. I know I have lots of squares and rectangles but there are lots of other things too. I have some of everything, plus some that I have no idea what that shape is called. I save it all and someday I will use it!! At least I hope I can. I have more strips and squares than any other shape. My scraps are all sizes and shapes — who knows what they are called. I have most of my scraps cut into strips and squares. It seems to be the easiest way to store them and access them for a quilt. Strips and squares. This book inspires me to dig them out! I have no idea! Scraps of all shapes, sizes and colors. I’ve been quilting for over 10 years and still need a system for my scraps. Help! Thanks. Just alot of half square triangles left over from other projects. My scraps are evenly split between squares/rectangles and leftover triangles. I have both although I think I have more triangles & rectangles than strips & squares. I have oodles of them all shapes and sizes. Mostly it is a surprise when I actually break down and go through them. I have all shapes and sizes of scraps because I seem to keep everything! They come in handy all the time. Do I have scraps? YES all colors and all shapes. I need this book. C. My scraps are all over the board in sizes and shapes. I recently started saving selvages also for a project. Thanks for the chance to win. I have plenty of strips, squares and rectangles but also quite a bit of what shape is that! I have made three scrap quilts recently and haven’t made a dent in my scraps. I like applique on most of my quilts, so I do not cut up a scrap until I need it. There might be some cut off triangles somewhere, but that would be the closest to cut scraps that I own. I have so many scrap shapes that I can’t begin to list them. Thanks to my Accuquilt Go Big electric cutter, I just keep cutting and piling into boxes, hoping for many charity quilts. Much thanks to my husband – 50 years next month – for his many hours of cutting for me, even though he wastes a lot of fabric that I could’ve used for other shapes if he placed the dies better. What beautiful projects! I primarily have strips and squares in my stash. I love scraps of any shape or size! My scraps are all shapes and sizes. I used to do a lot of paper-piecing, so I kept much smaller scraps than most would keep. They are divided by color (mostly.) I need to find a way to use them up! I have no ideas what to call my scrap mess -totally unorganized! This book looks terrific.thank you for a chance to win a copy. I try to keep on top of my scraps by cutting them into strips and squares so they will be ready to use. Love every single one of Lissa’s designs! All kinds of random shapes. My scraps is a hodpodge of shapes, sizes and widths. I have no idea what these shapes are in my stash. I only know I have LOTS of them! My scraps are not in any consistent shape. Maybe the best way to describe them would be chunks. I do have most of them sorted by color. I have mostly strips and squares, but also quite a few little triangles. I can always use new ideas to use up some of these "leftovers". All of the above plus fat quarter. A lot of everything! I have a hard time throwing any piece of fabric away. Piles of strips, tons of USO’s (unidentified shape objects). My scraps are any and all shapes. Some are so small I often wonder why I save them – maybe for a mini quilt…..? 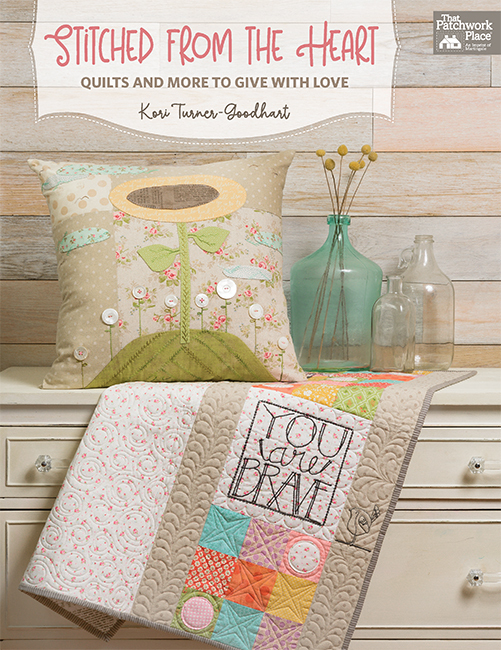 Love all the quilts in this book and more scraps to add to my collection would be fun to use. Most of my scrapes are pieces from boarders and bindings. Many of the smaller pieces are squares and rectangles. My stash is primarily strips and squares – 2.5″, 5″ and 10″ with a few more oddball sizes. Sure would love to win!!! Strips and squares, + ETC! Lots of strips and squares also boxes and bags of random size pieces waiting to be trimmed. My scraps are some strips but mostly undefinable shapes of all sizes. I have everything, mostly organized. I truly have no idea what my scraps are called — other than precious pieces. Sometimes my scrap quilts are from patterns, other times free-form, and sometimes paper pieced. So all scraps are valuable to me, no matter what size or shape they may be. A lot of all different sizes! Can’t throw any fabric away! I sew for Quilts of Valor and save as much fabric as possible in strips, squares and HST. I would love to win a copy of your book for some new ideas. I have a lot of strips and squares, cut off triangles and mostly questionable shapes. Probably strips and random squares. Most of my scraps are squares and rectangles or strips. I would love to use them up! I have so many Scraps I don’t know what to do with them! I would say most of them are strips and odd shaped pieces. I mainly have strips in various widths. There are probably more 2-1/2″ than any thing else. I would love to have the giveaway to create something new. Strips! Thank you for the chance to win!! My scraps are all different, from small half square triangle to larger random pieces. Guess I need to go through someday and cut them into standard sizes. Some are a mangled mess, but a few years ago, I sorted them out into sized strips and have them in a few drawers. C and I have so many I don’t think I will live long enough to use them all!!!! I primarily have 2-1/2″ strips. There are quite a number of other size strips. These always come in handy when i need a small piece of fabric to fill a small spot. I would love the bag of scraps and the book. I am always looking for books about scrap quits. They are my most favorite kind of quilt to make. I would like to say strips, squares, circles, rectangles, octangle, so truthfully I have no idea what all my scrapes are. My scraps are all shapes and sizes! Would love this book. I deal with scraps all the time. I have mostly squares and strips. One day I hope to make a strip quilt. Strips and squares for the most part. Love scrappy quilts! I have more strips and squares in my scrap basket. I have no idea what the shapes of my scraps are called. I leave the shape intact so I can use it whatever way is most efficient. I’m not sure what the would be called. I applique so maybe holes. I guess I could make just about any kind I’d wanted around the holes. Most of my scraps are in strips and squares, but also some bins containing larger pieces and FQs, sorted by color. This book looks like a great addition to my library. This book looks wonderful! I have all shapes and sizes of scraps. My scraps are "all of the above"! :-). Anything and every shape. I’m working on a scrap quilt right now and am amazed and excited because the scraps ALL end up looking fabulous together. I have scraps of every shape under the sun. The quilts in this book are beautiful! I have every shape imaginable! My scraps are in strips and squares with some rectangles thrown in. They are sorted by size which makes it easier to pull and use them when I need some smaller pieces to add to quilts. This book looks very good. I mostly have strips and all sizes of squares. I have scraps of every shape – and some of them are tiny – I can’t throw anything out! Thank you for the giveaway! I have mostly strips and squares just waiting to make that perfect scrapy quilt. I keep trying to organize them but somehow they keep piling up altogether. Love the patterns this book. I have mostly strips and squares just waiting to make the perfect quilt. This book has some wonderful patterns that would help decrease my pile. Most of my scraps are different sizes and shapes. There are a lot of strips that I would like to use in a strip quilt. So many scraps, so many shapes & sizes! I have mostly strips and squares just waiting to make that perfect quilt. This book seems to have several patterns that would be fun to make. Strips and squares would be how I manage my scraps. I have more strips and squares. No idea? All sorts of odd sizes and shapes. So many scraps just the book to finally use them to make a quilt. I have been trying to stay on top of my scraps and cutting them into strips, squares of various sizes. I’m an equal-opportunity scrapper and have every size and shape. I’m ridiculous, but I do love all the little pieces just as much as the yardage! My scraps are every shape possible as I repurpose clothing constantly. But my purchased ‘scraps’ are FQs and strips. My LQS sells batik bits by the inch, and I’ve found thm irresistible. 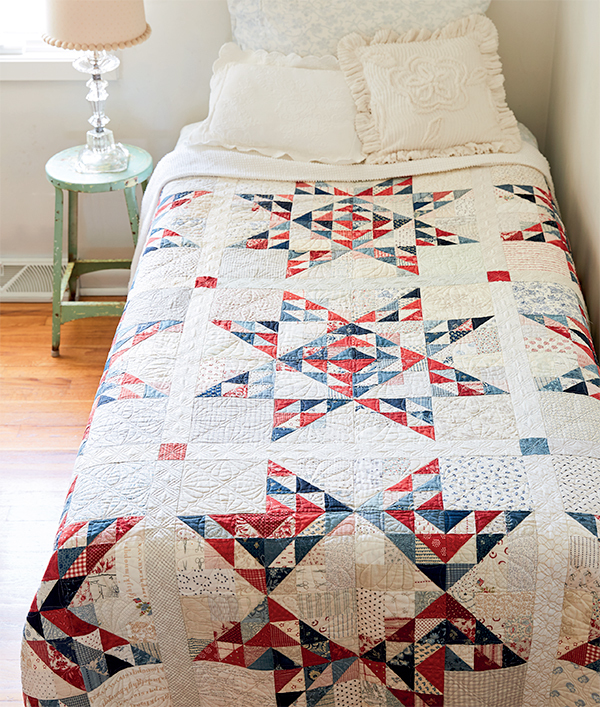 I love the look of this Lone Star quilt. It’s on my list of quilts to do. Most of my scraps are strips. There are a lot of squares trimmed to 2-1/2 inches . Most of my stash is fat quarters. I even save snippets in a beautiful basket for that next quilt. Love her quilts and patterns. My scraps are every shape imaginable! I’ve never managed them in any sensible way. I have squares; not all perfect but 4 sides. Same is true with triangles and other shapes that I have no idea what they are! But together they all look great. Strips and squares and other odd shaped pieces. I’ve been cutting a lot into 2″stares anticipating a really scrappy quilt. LOVE scrap quilts! I seem to have lots of strips and rectangles and tail ends of binding that I won’t throw away! My stash contains more triangles and rectangles. Scraps, oh boy! I do love scraps and scrappy quilts. Yes I have many! Recently have been trying to get a handle on them by cutting into squares of different sizes. Most of my scraps are in big bags, then in tubs! I do see some hope in my organization. Triangles and rectangles and strips oh my! Most of my scraps are strips and squares. These leftovers just get folded back with yardage. I need to take a week or so and separate them out by color so I can use them up. there are no words to describe my scraps. that’s why they are scraps! My scraps are all sorts of shapes, sizes, colors – I save everything! And I just finished a quilt made entirely with my scraps. Looks like I didn’t put a dent in them! Love to win this book and fabric! Thank you for the chance. They are all in my stash! However, I do have more strips & squares! Lissa’s scrap bags look awesome and I know the "Oh,Scrap!" book is great! If I win, you don’t need to send me more scraps! I have all of the above! A huge bag of not cut yet, as well as those trimmed to a usable size. They accumulate rapidly and seem to reproduce like coat hangers in the closet. No matter how I use them, they produce more scraps. Love the video for the lone star quilt. It’s on my bucket list, along with a double wedding ring. If I win, you don’t need to send me more scraps! I have lots of odds and ends and some bigger odds and ends. Strips and squares are the bulk of my stash. They could be partially used in one of these quilts. I used to have all my scraps in boxes according to size, boxes got too full so gave them all away, now I just have one box I throw all sizes of scraps in, really need to do something with them. I have boxes of strips, mostly 2” and 2 1/2”. I have even more boxes of squares, 2” – 5”. I really enjoy making scrap quilts! I mostly have strips and squares, some triangles. I would love to have the book to put my scraps to good use!! Most of my scraps are strips. My bee and I have done many strip exchanges by color and theme. I store most of my fabric as strips and squares. Lissa’s video was very enlightening and empowering. I Really want to try a lone star quilt using my scraps. I have all shapes and sizes of scraps but like to cut my scraps into squares and/or strips for future use! I have no idea what most of the shapes I have are called, I keep any scrap I think will work in a quilt. Also, have strips and squares. I’ve got all types of scraps…one shoe box full of strips, a small box of 5″ squares, a small box of 2.5″ squares, a big Rubbermaid tote full of "larger" pieces (fat 8th’s, trimmings, etc.) Anything 1/4 yard or larger goes on shelves. I have a full Rubbermaid tote just of flannel. any packaged strip sets and bundles goes in the tall file cabinet. I may have a problem…I may be a fabric hoarder. At least it’s a somewhat organized chaos. I have absolutely every size and shape imagineable in my stash. Some organized and some waiting to be cut for organization. I am slowly and gradually working at my goal of making scrap quilts from my stash. I have even started a Scrappy Sisters small group in my guild where we encourage one another to share/use what we have to make beautiful quilts! And it is working for me. This book would definitely be more encouragement for our group. You name it, I’ve got it! And some that I’m sure don’t even have a name. Would love to put some to good use. All of the above, and making scrap quilts does not use up scraps at the rate one would hope. My scraps come in every shape and color you can imagine! I’d say most of them are random shapes. I wish I were organized enough to have them sorted into uniform shapes and color families. I have scraps of all different shapes and sizes – but I don’t throw anything away – absolutely love the scrap quilt books. These quilts are beautiful. I would make several of them. Thank you for the chance. If I don’t win I will definitely buy. I TRY to make them strips and squares in limited sizes. Often my scraps stay together as leftover collections from a previous quilt that I’m not quite ready to separate and throw into the "Miscellaneous" scrap mix. I don’t know what all the shapes are called…… lots of parts and pieces with some strips, rectangles and triangles thrown in. Strips and squares. There are endless variations using them. I have no idea what these shapes are called. I throw anything and everything into my scrap bins! Scrappy quilts are my favorite!!! I have no idea, a little of this a little of that…..but finally got them organized and will be starting to look for patterns to dive into, love this book and hope to win this awesome giveaway! I have lots of strips and squares. I have most of my scraps cut into squares and strips, but plenty of triangles and odd-shaped pieces too. I have been dying to get a copy of Lissa’s book, but to win one plus her scraps would be fantastic! My scrap system is scrappy. I just put them in a container and save them for I’m not sure what! I have mostly rectangles and squares, but I also have a ton of larger scraps that I haven’t cut down yet. I have 3 boxes of scraps, and love that the quilts in "Oh Scrap!" are really made from scraps!! !I think that most of my scraps are triangles with the exception of a shoebox full of 2″ squares that I have been cutting from leftovers – waiting for the right pattern to come along. I have mostly irregular shapes, since I haven’t yet organized my scraps. Also, I’m afraid to cut them up. I might need larger pieces. I have an extremely large amount of scraps and it consists of everything -strips, squares, triangles, and unknown shapes. No way will I try to figure out which I have the most of. But I love my scraps and making scrappy quilts. I keep everything…small strips, large strips, squares, rectangles, triangles…i have them all! I have squares and strips, but mostly squares of the 2-1/2″ variety. I love those little babies; they are so versatile. Even though I’ve only been attempting to quilt a few months, I am already developing a stash. It is some triangles, some strips, and a whole lot of miscellaneous odds and ends with some fairly good sized pieces because I overbought assuming I’d make a lot of mistakes…….and I have! I have scraps in all sizes and shapes and some odd ball scraps from applique projects. I definitely have more strips and squares. Scraps of every kind and color…I keep them in a swing-lid trash basket, and they are escaping! I have way more strips & squares. Scraps, rectangles and squares, make the most amazing quilts. My scraps are all sorts of weird shapes. Someday I will organize, cut specific shapes and I’ll be all ready for lots of scrapalicious fun! I do have some squares, cut up and ready to go for my next I Spy quilts, but mostly I have bits and pieces in all sizes and shapes, including bonus triangles from bindings. My plan is to start to implement the Bonnie Hunter Scrap Users system, but so far that hasn’t happened. The scraps are sorted by warm and cool colours, neutrals, Christmas, and batiks – but that’s as far as it goes, at this point. A book like this could inspire me! I have a big mix of straps, strips, squares, half-square triangles, big hunks, and orphan blocks! I love to make scrappy quilts! Mostly strips and squares, or at least that’s what I’m aimimg for. Definitely strips, squares and rectangles. Triangles & rectangles! I love fat quarters! My scraps are mish mash of sizes and shapes. I Love scraps! I have all shapes and sizes from cut squares and strips to crumb pieces I put in a big plastic container to make coin strips. Someone gives me their scraps and I am in heaven! Strips and squares. I love this book! My scraps are strips and squares! Thanks for a chance to win! I HAVE NO IDEA WHAT THEY ARE CALLED,I AM TRYING TO LEARN TO DO PICTORTORIAL QUILTS THAT MEANS MATCHING THE COLOR BLEND OF THE FACES OR OBJECTS I AM USING!!!!! I’d say half strips and squares and the other half are larger, odd shaped pieces. I have all my scraps organized by color. I’ve made one strip piece quilt, but have lots more scraps to use up! This book would be great to have for more patterns on using up scraps! Definitely more strips and squares in floral designs. My scraps are mostly chunks. I hesitate to subcut into strips or squares if I don’t know what my project will be. Thanks for the chance to win the book and scraps. I have a tub full of strips and squares, organized by size. I have mostly strips, squares, and rectangles. I love 1-1/2, 2 and 2-1/2 squares for a scrappy quilt. Mostly strips and squares. I find those are easier to use when I need them and half of the work of cutting is done. Scrappy quilts have always been my favorite! I don’t usually keep my scraps. I donate them for dog beds at the shelter. Strips and squares. Ready anytime they’re needed!!! Mostly strips and squares by design — that is because I try to pick my scrap projects out before I have the scraps so I know what I need! However, I also love saving triangles leftover from "sew and flip" cuts! I have all sizes, all over….yet I am always saving everything!! I do have some sorted into HST, strips and civil war scraps and REDS. Love scrappy quilts. I do not know what to call the shapes I have left. I have all kinds of shapes. Thanks for the chance to win! I am an absolute sucker for scrap bags. I just came home from my mini-group with a bag of batik strips that one of the ladies brought. And it’s not as if I don’t have enough scraps of my own. In fact, I am trying to get them organized and cut into uniform sizes — mostly strips and squares. It seems the more I organize, the more scraps I have! I have lots of scraps of different sizes. Can’t throw away fabric! Well, I have all shapes & sizes of scraps but I would say they are predominately squares & rectangles along with 2 1/2″ strips. Love this new scrap book. Thanks for another great giveaway! Some day maybe I’ll be one of the winners. I have lots of scraps of different sizes. I can’t throw a w at fabric! I try to save all useful scraps in very shapes and sizes. I also try to sort them by color. I have lots of scraps of different sizes. I can’t throw away fabric! strips, some chunks but 2 1/2″ generally wins. I have odds and ends of scraps. No definite shapes or sizes. I have odds and ends of scraps, no definite sizes or shapes. All shapes and sizes! I save odd shapes to cut out applique pieces and the other shapes go in all kinds of quilts. I have mostly squares and strips. I use my go cutter when my scrap basket is full and then I have them organized by color and size. This has made sewing practice blocks and scrap quilts so easy! You can never have too many scraps!!! Mine tend to be all different shapes, sizes and colors. It would be hard to put them into a category. Most likely, it would be strips and squares, but also pieces from half yards, too. My scraps come in all colors, shapes and sizes. I try to organize by size. I would be delighted to win Oh, Scrap! Even though I have done a better job of sorting lately, my older scraps are a bit of a mess of sizes and shapes. Lots of bins on strips in several widths and a few bins of squares. Still have bags of strings and bits. The bins give the illusion of organization! Millions and millions of strips! At least it seems like that many when I try to corral them into some sort of order. I have every kind of scrap! Mostly strips and squares, but I also have odds and ends that aren’t cut into any shape. Oh Scraps, I have them all. Some regulars shapes and some I could probably do without but just can’t throw them out. My scraps are every size and shape. I can’t bear to toss anything. I usually save strips and squares, anything larger than an inch. A larger piece of fabric stays in one piece and it is put back into my fabric stash to wait for another project! Thanks for the giveaway. I would love to have this book and fabric! My scraps are every shape and size, I can’t bear to toss any! I fall into the “ I have no idea hat these shapes are called” category. I save everything ! I adore the quilts in the Oh, Scrap book! However, I think I am scrap challenged. I have scraps of every size and shape, I just can’t bear to toss any! Most of my scraps are organic shapes. I absolutely love the scrappy lone star quilt. I have scraps galore and mostly strips and squares! I have every kind of scrap and often don’t know what to do with them. This book and fabric looks amazing.! I have random scraps, can’t throw anything out. It would be fabulous to have a book of fantastic ideas like Lissa’s book. I have quite an assortment of no name shapes, everything from 1″ and larger! I have many shapes and sizes of scraps that are left over from quilts, applique and doll clothes. I also have various scraps that are left over from some clothing that was made. I have always wanted to make a lone star quilt and also some scrappy quilts, but just haven’t gotten around to it yet. Can’t throw any big/little pieces…squares, rectangles, triangles, "V" shape, etc. away…just know they can be sewn together to create a scrappy table runner, table topper, placemats or perhaps a small quilt for a little one. I definately do not what shape you would call my scraps. I save everything that is over about 2 inch square and my scraps are in all different shapes and sizes. Then I sort them by color. I love to pull scraps so that I can make blocks. The scrappier the better is what I say. Lots of strips and chunks. Love to make scrap quilts. Most of my scraps are cut into the biggest piece I can get. Rectangles, squares, triangles and then just stripes of different lengths. Good luck everyone. And thank you for the chance to win. I have no idea what they might be called. Have fabric leftover from projects and a few cut strips cut to size for string quilts. Most of mine are stripes and squares. Sounds like a great book. Unfortunately, I have a hard time discarding any scraps. But, I mostly use strips and rectangles and squares. I keep my scraps in different containers sorted by different size strips, squares, and other shapes so they’re easy to find. Anything large I keep in a big piece…smaller scraps I cut to 2 1/2″ strips since there are so many jelly roll patterns. I’m ready for scrappy jelly roll patterns when they pop up since we all start new projects before finishing works in progress!!! I have all shapes and sizes. Some organized into various strips and 2 1/2” , 3” and 4 “ squares. And a drawer full of sizes awaiting organization. I have all kinds of scraps, strips, squares, rectangles and many shapes ready for string piecing! Oh Scraps looks like a really fun book to help me use up all kinds of scraps! Thanks for a chance to win. I have so many scraps and have begun to suspect that I am a fabric hoarder/collector .. I challenge myself to only make quilts out if my stash.. going by my stash I suggest it’s not working..
My scraps are an assortment–reproduction, brights, designer collections. 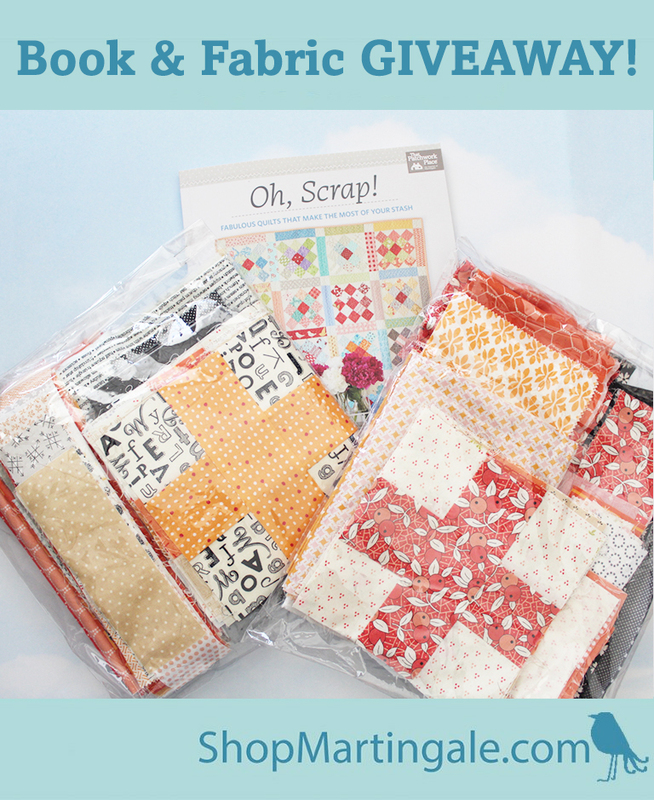 I have and love the book, O Scraps!, and if I win the free copy I would be thrilled to gift it to a friend which seems what quilting is all about. Sharing knowledge and the fun of quilting with friends. Enjoy!! I have A LOT of charm squares & cut more of them from project leftovers. There are plenty of strips & FQTs in my stash, too. My scraps are every shape imaginable – I should get them under control & use them up! I have quite a varied amount of shapes. Probably the most are strips and squares. Thanks for the drawing. Strips and squares for me, and maybe a few rectangles as well! I have mostly strips and squares. My scraps are all different shapes and sizes! I have no ides what shape most of my scraps are!!!!! i really must get in my sewing room & sort them out! maybe i could make a scrappy quilt with them to reduce them dramatically – problem solved! thanks for the chance to win. I try to keep my scraps organized by shape and size. I’m keeping all the small triangles in a large mason jar… so pretty! I put my scraps aside for smaller projects. I have strips, squares, rectangles, triangles, and a lot of shapes that I don’t have a name for. I love sewing scrappy quilts! Lots of squares and rectangles.. I have a ton of scraps!! Most of my scraps are leftovers from the quilts I’ve made. But, I do have pieces of fabric that friends have given me or I have bought at antique shops. I have all sizes of scraps. Recently, Ive started to get control of the "mess" by cutting the larger pieces into 1 1/2″, 2″, 2 1/2″ and 5″ squares. I have squares and strips.Enjoy making scrappy quilts for charity and for children in the hospital. Most of my scraps are triangles and rectangles with a few strips and squares. My scraps are a variety of shapes organized by color. Thanks for the fantastic giveaway! I have a little bit of everything. Some smaller scraps, but some bigger pieces too. I don’t like to cut my favorite fabric until I know exactly what I want to do with it. I have an assortment of scraps including strips, 5″ squares, rectangles and more. I love this book and would love to win it!! I have fallen in LOVE with scraps. I am in the process of cutting mine to usable sizes. Your book would be great to work some of these fun things up. Sure hoping to win. Strips and squares. I gave all my triangles away and at times wish I hadn’t. I have no idea what most of the shapes I have are called! I really need to cut them into usable sizes and shapes. The book would really help me reduce my stash. Hope I win (fingers crossed). I have no idea what most of the shapes I have are called! All sorts of shapes. Oh gosh, I am afraid I have a lot of all three categories. Fortunately at the June State quilt show we are doing "quilt for others" using the Heart Strings block. We hope to donate them to the new"Jeremiah House " for young single moms. I am trying to cut leftovers into 1 1/2”, 2”, or 2 1/2 “ squares to make a quilt. But have lots of strings and chunks too! You could also find bags of triangles trimmed from previous quilts. In essence I guess I have all the shapes! I have scraps in all shapes, sizes and colors. I would love to win some from Lissa. 3rd option! My scraps are in all shapes and sizes! Love the book preview and video. I mostly have strips and squares. 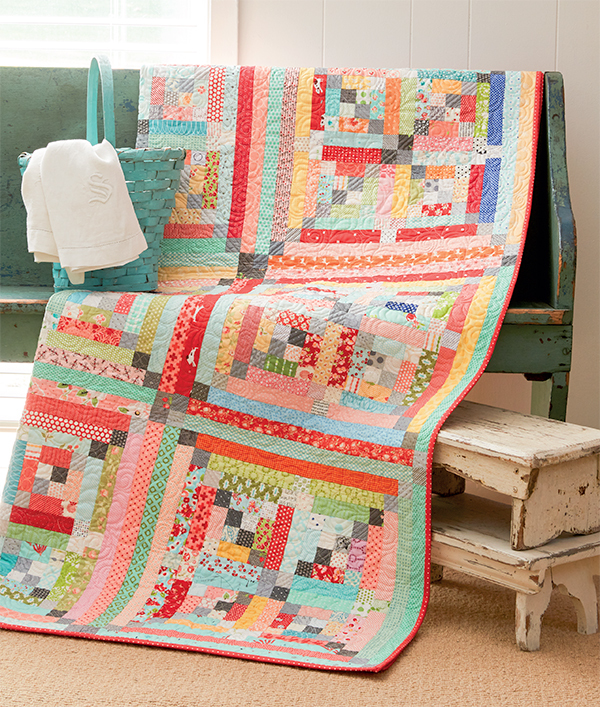 Love Lissa’s colour combinations and ideas for her scrap quilts. every shape imaginable! All shapes & sizes (& colours!) I do a lot of ‘stich&flip’ with my scraps. Sometimes the amount is overwhelming! I have no idea what shapes of scraps I have !!!! I just have lots of them. Strips, squares and blobs. The dreaded unidentifiable mishmashesnof fabric that defy description. Strips and Squares! I’ve been wanting this book and would love to win it and the scraps! Thanks! Most of my scraps are triangles. these beautiful quilt patterns from Lissa. I try to cut most of my scraps into either strips or squares to use in scrappy strip quilts or to make half square triangles. But the bulk of them are random rectangles in the wish box! My scraps vary in size and shape – depending on what everyone gives me! All my quilting friends are very happy to enable my "scrappiness"! I love the scrappy Lone Star. Might have to try that one! Some fussy cuts leave me with swiss cheese scraps. Most of the rest are strips, triangles, or rectangles. I have some of various shapes but mostly strips and squares make up the scrap stash at my house. My scraps are mostly strips, because I can use specialty rulers to cut them into various shapes. The strips vary from 1 1/2″ to 5″, depending on the size of the fabric I am cutting them from. When I have time, I cut up my scraps into strips or squares. And I have lots of leftover triangles too that I recently bagged and passed along to someone I know who will make better use of them than me. I am happy to be participating because the book looks like it could help me use some of those scraps. I have 1 1/2 inch strips 3 to 9 inches long and lots of squares in varying sizes, just in case. Plus lots of fat quarters, just in case. I have mostly strips of various widths. I cut my scraps into strips and squares. I’ve been working on getting mine into strips and squares. I have scraps in all sorts of sizes including lots of yardage masquerading as scraps. I have no idea what most of the shapes of my scraps are called. All kinds of scraps…..trying to organize but they multiply in the dark!!!!! Most of my scraps are definitely strips and squares. I can always make half square triangles, etc. from these types of scraps. Thanks from me also for a chance to win. Well, I have lots of strips, and a lot of triangles and rectangle and many other odd sizes, I have a lot of scraps, may use some day, I hope! Strips and squares. On that I could organize them into these beautiful quilts! Not sure if my comment got through or not. I love scrap quilts and I have mostly squares and strips sorted according to sizes and the largest possible chunks possible. Thanks for the chance to win……how fun! Mostly 5 and 10 inch squares, sorted by color. Mostly squares, strips and CHUNKS! I’ve cut a lot of my scraps into squares. A lot of the rest are random shapes. I cut all my scraps in strips for string quilts for the most part. However I do have one bag of squares. A. Squares and strips. At least squarish. Mostly strips & rectangles, but definitely some triangles as well! I keep all of my scraps, as I really want to make a scrappy star quilt! Just need to organize my stash! LOL! Strips and Squares! No triangles. Mine are mostly weird shapes! Most of my scraps are just that – scraps. Very few strips or squares or rectangle and definitely no triangles – just scraps. I obviously need to get a lot more organised. Strips and squares make up most of my stash. I have been on a mission to actively use scraps in as many projects as possible. This would help me stay on track! I have all sorts of scraps in every shape; bins of them! Would love the chance to win a copy of the new book, Oh Scrap!. Thank you. I have mostly strips and squares and triangles and rectangles. Thanks! I have lots of scraps, mostly squares and triangles. Thanks you for offering us an opportunity to win Lissa’s book. I really like her creativity! I store my scraps by color. There are many sizes and shapes, most in rectangles and squares. My rule of thumb is that once the bin begins to overflow, I commit to either giving some away or using it. It’s my way of managing the madness! My scraps are of no name! I will spend time to cut strips or squares, sew half squares and cut them to a usable size, but that only happens when I really don’t feel inspired to make any particular project, yet want to work with fabric!!! My scraps have no particular Sharp. I think we could use more scraps if we use triangles and rectangles. Beautiful book! Stries and squares. Great tutoriel and beautiful book. Thank you! I save all my scraps so I have bins of all shapes and colors! i have squares and strips of scraps. I have no idea what most of the shapes I have are called! Haha! I have sooo many scraps, I probably could make a dozen quilts! All the above. Could use some extra ideas to use them up. Most of my scraps are rectangles and squares, some triangles , too. This win is a dream!! Most of my scraps are strips and squares. I have mostly strips and squares but also have a large npbin of odd cuts. I have my own scrap saver system with which I save squares, rectangles, strips and strings. Scrappy blocks are the best! This book is just wonderful! I hope to be able to make them all. Thanks for the opportunity to win a copy, and more scraps would be heavenly. My scraps are every shape and size. My scraps are strips (1.5″ & up), squares (2″ & up), and oodles of triangles plus larger rectangles of various sizes. I hate throwing away the good stuff! My scraps are all sorts of sizes, shapes, colors, and patterns. They go into a tote container and when I have a project calling for scraps.. I muffle through them to see what I need or can use when a project comes along.I tired organizing them in a rolling cart/draws.. Just too many scraps to fit into draws and the would fall out easily. I use all of the scraps as long as the size is right. I have trouble parting with anything larger than 2”!. Love your scrappy quilts! I would call what is in my scrap bin "bits and bobs". They are the leftovers I haven’t gotten around to trimming down. I try to keep the strips and sized squares and other pieces in their specific bins. That way when I want to create something, I’ve already got something cut ready to go & sew!! I have strips, squares and triangles as well as snippets. I have the strips sorted by size and shapes sorted so that when I need specific pieces I can find them more easily. I keep my smallest pieces separated in gallon plastic bags specifically for mini quilts. I have no idea what most of the shapes I have are called! However, I have a majority of them separated by color! I have no idea, Many many shapes and sizes. I love colors! I mostly have strips and squares…. and maybe a few odd sized pieces. My scrap bin has all kinds of sizes and shapes. I love going through it now and again which always brings me down memory lane! Most of my scraps are in strips or squares. I do have a smaller collection of odd shapes, but often trim them down to a squares or rectangles; or make pinwheels. Scraps of all sizes — I can’t throw fabric away! Lots of strips but also other shapes. I give most of my scraps to a friend who quilts for Project Linus, but I do keep the ones that are really special to me. This looks like a great book, thank you for the giveaway. Squares and chunks are the shapes of my scraps. Such a lovely book! Most of my scraps seem to be squares. My scraps are a big tangled mess in several huge storage bags. I always intend to start one of the scraps saver methods but never make it to the finish line.i wish the scrap fairy would come do it for me! Strips and blocks and also just stacks and stacks of folded fabrics! Definitely strips and squares. 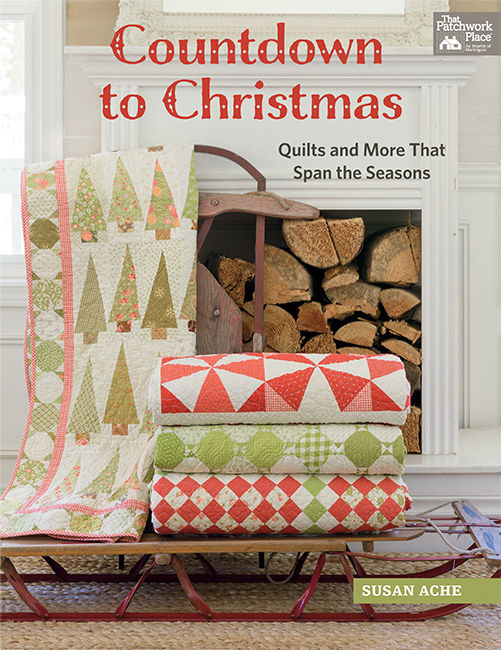 So many lovely quilts in this book! Thanks for the giveaway! I save strips and squares. Let’s just call them "polygons"
My scraps are very organized. When I’m done with a project left over fabric gets cut into strips or squares. The squares are organized by size and color. The strips are just by size. I’m a bit OCD however it’s good when I want to start a project I can start with what’s in my scrap stash and use them up. I have lots of scraps. I keep them organized by strips and squares in a variety of sizes. It makes them easier to use when i need to stay a new project. My scraps tend to be blocks of fabric – like a 1/8th yard of a leftover piece. I also have many 2 1/2″ strips left over from bindings. Often (because I tend to gravitate towards similar colors)I will have a scrappy color theme binding which gives a interesting finish to the quilt. Most of my scraps are strips and squares. 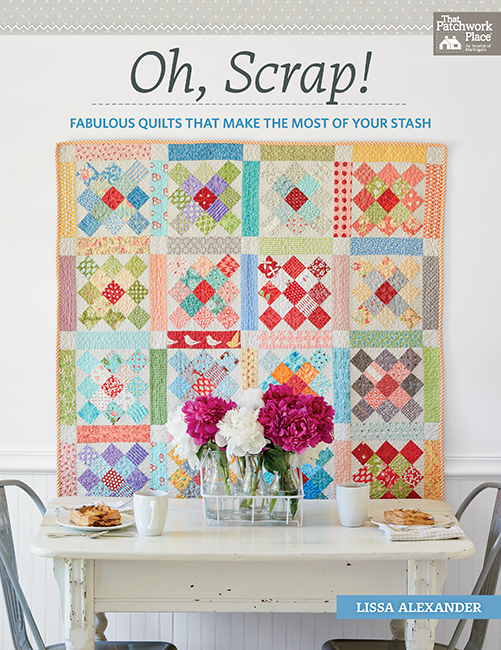 Thanks, Lissa, for your wonderful new book of scrappy quilts. I have strips, squares, and triangles. I love them all. Oh Scrap! Do I love scraps! Primarily strips are my thing as I ❤️ to make strip pieced covered baskets☺️ I do love that Sherbert Stars Quilt! Amazing:-) I would absolutely love to win the wonderful scraps and book! My scraps are of no particular shape. Someday, hopefully, they will be in squares. I have a lot of jelly roll strips, charm & layer cake squares in my stash. I have a lot of strips and triangles. My stash is out of control! Strips and squares make up the most of my stash. I like to cut 2 1/2 inch strips; so many things can be done with the strips. The majority of mine have no shape. They are left overs waiting to be cut in the shape needed for a future quilt. 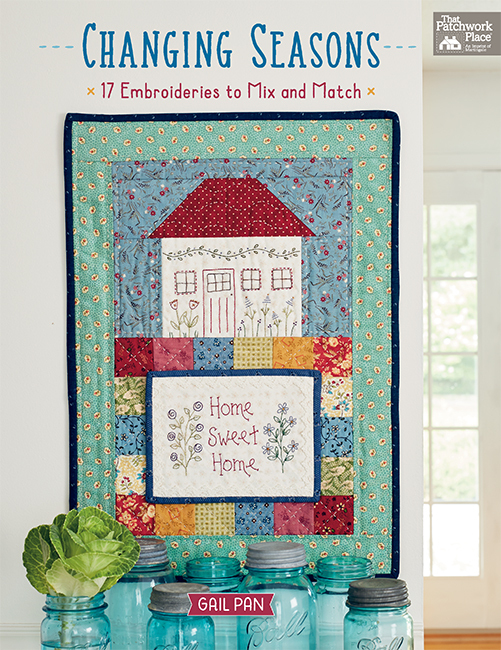 This book sure provides some great scrap quilts! I still use small scraps as stuffing for home-made toys, but my larger scraps, including strips and squares of fabric are now saved for "scrappy" quilts. I have no idea what the shape of my scraps are called! Strips and blocks and a few oddballs! Strips and squares, and anything that can’t be cut into a "useable" square or rectangle counts as strings, which go in their own bin! Would love to win this book. My load of scraps sure too many to describe in shape. I do however, sort them by color at least once a year. Definitely lots of strips and squares and some I don’t even know!LOL Love Lissa’s work and beautiful project! Thanks for the chance! I have mostly strips. Would love new ideas how to use them up. I have no idea what shape my scraps are. Some are squares, some are strips, some are? What I do know is they are scraps. I have lots of scraps.The majority are strips and squares, but plenty of other shapes too. I cut my scraps into strips and squares with the hope that they will be used faster than if I left them as is!! I have no idea. I have every shape under the sun! My scraps are mainly strips and squares. I saw several different blog posts from different quilters and that is how they keep them "tamed" and I started doing the same. It really helps!! Thanks for the chance to win the lovely book and the AWSOME quilt blocks!!! My scraps are definitely in the strips and squares category! I love the photos from the book! My scraps are mostly strips. Thanks. I have no idea how best to classify my scraps. I have a little bit of everything. I have no idea what most of the shapes I have are called! Shoots, I have no idea where most of my scraps are! Mostly Strips and squares, but I also have odd pieces in small drawers. I sort my scraps by shape. Strips and squares require two boxes. But triangles are doing fine and may soon need another box. My scraps are made up of numerous shapes and sizes. My scraps are every size and shape imaginable. I love to make scrap quilts so I only buy small quanties of fabrics and just cut what I need as I go and the rest goes back into one of the plastic buckets I use to store fabrics. I have a lot of fun looking through my stash when I start a new quilt and seeing what pieces I have that are large enough to cut the pieces that I want. I have all kinds of shapes in my scraps. I use them constantly to make different things. Would love the Scrap book. Strips and squares. My boxes are full and I really need to spend some quality time sorting them by color. Fun! I have cut most of my scraps into squares and strips and they are just waiting for me to put together. I cut my scraps into 2-inch, 3-inch, and 5-inch squares, and collect them until I have enough to make a quilt for charity. Then I start collecting again. I have everything! The strips are somewhat organized by size using Bonnie Hunter’s method. I have no idea what most of the shapes I have are called! Some are triangles, some squares, but mostly no specific shape. Would love to win! Thank you for offering the give away. Most of my scraps are strips and squares. The book has some great scrappy quilts. I also sort by colour so my scraps are all kinds of shapes! But my sewing area is due for a big overhaul so maybe I’ll start organizing them. Love Alissa’s book and patterns! I’m addicted to scraps! Love the look of the quilts that Lissa makes. Most of my scraps consist of several sizes of squares. Perhaps I should start cutting strips too! Her video is great! Definitely strips. I have a few containers of varying sizes. Thanks! Boy do I have scrapes because I can’t bring myself to throw out any fabric that is bigger than 1 square inch. So my scraps are of all shapes and sizes. I have bags and boxes of ALL kinds of scraps! Oh Scrap!!! I have every shape imaginable! Large, small, and in between. I love the scrappy look in quilts, and cannot throw away even the smallest pieces! I think I am at the stage in quilting that my entire stash could be called scraps. I try not to buy any more fabric but to no avail. The sizes range from 1inch to a couple of yards. The 1 inch ones are from making quilt ‘pictures’ by copying counted cross stitch designs with fabrics. Oh the scraps! Yeesh! So many. The ones that have been cut are in squares and strips, but there is quite a mishmash of scraps that are waiting to be cut… into anything. They’re a bit of a mess right now, but I know they’ll be awesome when they become part of a quilt! My scraps are random sizes and shapes. I’ve cut a few into squares and strips, but not very many. It’s a long term project which I will work on bit by bit when I don’t have the energy to do anything requiring concentration. I save them all, you never know when just that piece is needed! I have the entire list of sizes in my scrap bins. They need organizing!!!! I’d love to pull some out and put them with the winning scraps to make one or more of Lissa’s gorgeous quilts. What beautiful quilts to look forward to making. Every size, every color, every shape all mixed up. Love fabric! I seem to have a lot of triangles and rectangles. Squares and Strips. Two large bags of scrap stash. Would love to get some great ideas from your book! I have no idea of what I have. I have multiple scraps in every category and some of them are sorted and others need to be sorted. Strips,squares, triangles, rectangles and any other shapes make up my scraps. I tend to save them all. Sorted according to color but after that who knows what shape they are. My scraps are all shapes and sizes. Triangles and rectangles. I love scrappy stars. I have many different shapes and sizes, big and little pieces. I don’t cut any scraps till I need them. At one time I used to cut up pieces. I cut up a bunch of 3 in. pieces an d later need 5 in. squares. I have a lot of different size pieces and strips in m stash. I often sew some to make mug mats for friends. I met a lady who bought a bag of my scraps at a sale and said she pieces them as a relaxing thing to do at the end of the day. She makes them into a quilt and donates them to a shelter for survival animals. When a piece is too small she keeps it for her daughter who is confined to a wheelchair and she creates mini quilts for dollhouse collectors! It’s so rewarding to see where all scraps can be used. I have no idea what most of the shapes of my scraps are called. I just can’t seem to throw a scrap away. Strips and squares are the shapes of most of my scraps. I love this book! My scraps are all over the place – literally and figuratively! I have no idea what name my scraps are but I have alot of them. I would really like to sew a scrap quilt and try to use some of my unidentified scraps. Strips and squares make up most of my scraps. Would love to win the book for inspiration. My scraps are my history of quilting! I have strip, squares triangles and chunks! Scrap or multi fabric quilts have always drawn me in. Just love them and Oh Scraps! All kinds of shapes, so a new scrap book would be great!! I recentally made a table topper of my friends daughter that moved closer to home. I did’t realize untill I had made the strips that I could have done so differant, but she loved it . I would like to know your secrect to easielly do this. My scraps are stripes & squares in 1 1/2”, 2”, 2 1/2”, 3”, 4”, 5”, 6”, boxes. Ohhh those stars are great. I have all kinds. At one time they were all cut into sizes. Squares & squares but they might end up triangles. Always wanted to make a Lone Star Quilt and this scrappy look is Awesome ! I save all scraps because I love making many different things, quilting and otherwise. Thank you for the opportunity to win this bundle!!! I have scraps of all shapes and sizes. Just need a good way to put them all to use! I have a fair amount of scraps. I am currently working on cutting 2.5” squares. I want to make a stamp quilt with them. So I will be able to use a good portion of my scrap pile! I have all sorts of scraps. I am currrntly cutting them into 2.5” squares and 5” squares. Also strips of whatever size I have. If they’re cut already I probably would be more apt to use them for a quilt. I think scrappy is my fav type of quilt! Oh, Scrap! What beautiful Quilts!! I have varied sizes and shapes of scraps in my stash. My scrap stash is lots of various shapes and sizes of left over pieces from quilts I have made in the past. Of course I also have the endless stack of assorted pieces I have purchased over my many years of sewing. This would be a super win! Awesome scraps! I have scraps in every shape and size, hehe. Looks like a wonderful book that I can really use! I have all shapes and sizes. I don’t cut them into any specific size or shape. I do have them sorted by color in boxes. After I finish Christmas gifts, I need to make several scrappy quilts to winnow down my boxes. to organize have not gone well. I try to cut smaller scraps into strips or squares, then sort them together according to size. Then they are ready to go when I have a scrappy project. In a way, I am making my own charm squares and jelly rolls. I have every shape and size of fabric scraps. I love all fabric equally. 🙂 Thanks for the giveaway. Most of my scraps are strips of squares and rectangles but I do have a small collection growing with triangles. I love making use of these in my projects. I mainly have squares in my stash. They’re easy to use to make fast quilts. I decided to cut up fabrics I’d use for scraps this year. Mine are now 1”, 2”, 1 1/2”, 2 1/2”, 3 1/2” & 5” strips I also have squares from 2” to 6” and lots of triangles! The 1 1/2”, 2 1/2” and 5” strips are sorted by color. It’s so much easier to use my stash now! I have no idea of what I have and I have many. I put all my reasonable sized scraps into a bin, and then every so often while watching a movie or tv, I’ll cut them into the biggest usable sized square or strip that I can. A little bit of everything! Thanks for the chance to win this great book. I have many triangles and squares! Other shapes too. Way too many, but love them. Mostly strips and squares… I sew the leftover triangles into Half square triangle squares so they are ready to use. My scraps are mostly squares & strips. I have no idea! A big fat mess of scraps! Strips and squares and rectangles. I sort my scraps by size in boxes. I love scrap quilts . All of the above, boxes of strips, squares, random pieces, bags of scraps. I have two scrap quilts in progress with more in my mind. How will I ever use them up. I do sort of have my scraps sorted by color (well mostly) but there all sorts of sizes and shapes thrown in the clear shoe boxes I store them in. I always think I am going to cut them into particular sizes and shapes but then I never know what kind of quilt I might want to make next so it never happens. your book looks really interesting. Well, the small amount that is somewhat organized are strips and the rest are just odd shaped pieces. Most of my scraps are strips, squares and rectangles. Lissa’s book looks terrific! All of the above. I do maintain an organization to my different sized squares and my long strips are in one container; but that ends with the rest of my fabric scraps. Thanks for the opportunity. I have no idea of the shape, I keep scraps of Kim Diehl’s fabrics so when I need 1” squares I can use scraps! I’d have to say that mine would be a mix of squares and triangles. It really is hard to bin any piece of fabric that could become a filler in a scrappy quilt. Mostly strips and triangles ready for sizing. I try to use up collections for small projects and then move leftovers to shoe boxes if small or back to the stash. I love scrappy quilts, so my scraps are made up of anything and everything bigger than an inch. I have 2 big drawers full, one for lights and one for darks. But then, you’ll find them in other bags and boxes, too!! I have all shapes of scraps from small yardage to crumbs! I have no idea. I do know it is a mix of everything. I would have to say Strips and squares. I have alittle bit of everything. Strips, squares, triangles and don’t know what this shape is called! I have mostly triangles and rectangles and strips. Lissa’s ideas seem so practical and it would be fun to make some of her quilts from her book using some of her scraps and mine! Thanks! I have mostly strips and squares! !